The theme groups of dementia, diabetes and frailty have been selected as symbolic of a broad level of a person’s function and care and accommodation needs in the community. Technology and health economics are cross cutting themes of the Global Think Tank. Citizens globally will be directly or indirectly impacted by dementia, diabetes or frailty across their life course in an unprecedented way in the next two decades, through either personal diagnosis or care of a loved one. The World Health Organization (WHO), the United Nations, government, industry and the NGO sectors have had condition-specific calls for action to better understand the implications of these consequences of these conditions as well as to how work collaboratively in creating solutions that are transferable and replicable. As of 2013, there were ~ 44.4 million people with dementia worldwide; a number expected to increase to about 75.6 million in 2030, and 135.5 million in 2050. The total estimated worldwide cost of dementia was $604 billion US in 2010 with ~70% of these costs occurring in Western Europe and North America where population ageing has matured. The figure includes costs attributed to unpaid care (from family and others), direct costs of social care (from professionals and in residential home settings) and direct costs of medical care (primary and secondary care). Today, there are 382 million people living with diabetes. A further 316 million with impaired glucose tolerance are at high risk from the disease – a number Terrarium that is set to reach 471 million by 2035. Personal and financial costs of the burden of diabetes are colossal, inciting some 5.1 million deaths and consuming some 548 USD billions dollars in health care spending (11% of the total spent worldwide) in 2013. Estimates show that 76% of global health expenditure on diabetes in 2013 was for people between the ages of 50 and 79 years. People with diabetes are at risk of developing a number of disabling and life-threatening problems. In most high income countries diabetes is the leading cause of cardiovascular disease, blindness, kidney failure, and lower limb amputation. As the prevalence of diabetes (type 2) grows so too does the human and economic impact of these complications. Frailty is considered highly prevalent in old age and correlates with a high risk of falls, disability, hospitalization, and mortality. 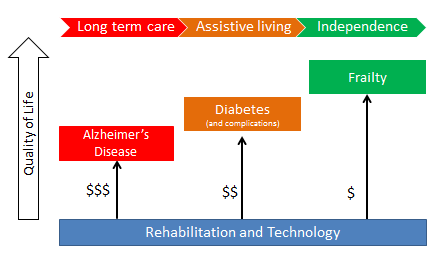 Fried et al (2001) in ground breaking work on frailty suggested that while frailty has been considered synonymous with disability, comorbidity, and other characteristics, it may also contain a biologic basis with a distinct clinical diagnosis. Frailty can cause an older person to lose their ability to function independently, experiencing a general feeling of exhaustion with low levels of physical activity. It is often associated with weight loss or cognitive impairment, depression and or dementia as well as multiple co-morbidities. It is expected that the number of frail older people living in the world will increase in association with the ageing population. As an example, in France 10% of older people are frail, increasing to 25% in the subgroup of those over 85 years of age. Eighty percent of frail older people live at home and more than 680,000 reside in institutions including assisted living, nursing homes and long term care.